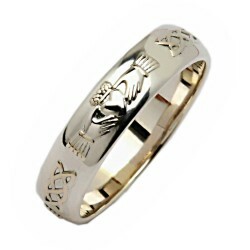 This is a beautiful Claddagh Band Ring made from Platinum. It has the classic features of Heart.. Platinum Wedding Rings and Engagement Rings have become extremely popular in recent years. Our range of Platinum Jewellery is among Ireland's finest. Fado Jewellery are world renowned for their design and attention to detail in manufacture. Hallmarked in the Dublin Castle Assay Office to guarantee its provenance and metal purity!